(JTA) — Nazi death marches crippled Mr. Cohen’s knees. The 94-year-old who survived Auschwitz now felt defeated trying to climb the stairs to his walk-up condo. He and his wife of 66 years used to be highly active in the Holocaust survivor community and frequently spoke at schools, but the onset of her dementia, and his now frequent falls, have stopped him in his tracks. But thanks to a grant from the Jewish Federations of North America’s Center for Advancing Holocaust Survivor Care and the commitment of his local federation, Mr. Cohen’s Jewish family service agency hired a nurse to come to the couple’s home. While the nurse could help Mr. Cohen bathe and dress, she struggled to understand why putting on his special compression stockings and shoes made him so anxious. With further help from the JFNA grant, the nurse received training in Person-Centered, Trauma-Informed (PCTI) care, which helped her to better understand the unique psychological and emotional sensitivities of Holocaust survivors and adapt her care accordingly. Through the training, she came to understand how important Mr. Cohen’s feet were to him — the feet that carried him miles and miles through snow and mud. Now that his nurse knows to take special care with his feet, Mr. Cohen no longer struggles to leave his home. He can remain part of the community and avoid social isolation. The Cohens’ story is one of over 8,000 success stories made possible by JFNA’s Center for Advancing Holocaust Survivor Care and local federations. Powered by a federal grant and money raised by federations across the country, JFNA’s program is revolutionary both for its national reach and its use of PCTI techniques. PCTI care promotes the dignity, strength and empowerment of trauma victims and helps caregivers respond to Holocaust survivors in culturally appropriate ways. Since the program’s launch, it has trained 2,000 professional caregivers in PCTI techniques and supported 300 family caregivers. Thanks to the PCTI model, more Holocaust survivors are receiving the care and support they need, like the 80-year-old man in California who is discovering the wonders of yoga for relaxing his mind and easing his back pain. Or the survivors in Kansas who are spirited away to happier times with concerts of old Yiddish songs. Or the man in Florida who, thanks to the therapy he received, was able to recognize that his anxiety attacks were being triggered by fears that his declining vision left him vulnerable to capture by wartime enemies. PCTI care can help survivors deal with the triggers associated with aging. Innovative programs supported by the center, shared with a vast social service network, are also helping people beyond our community. 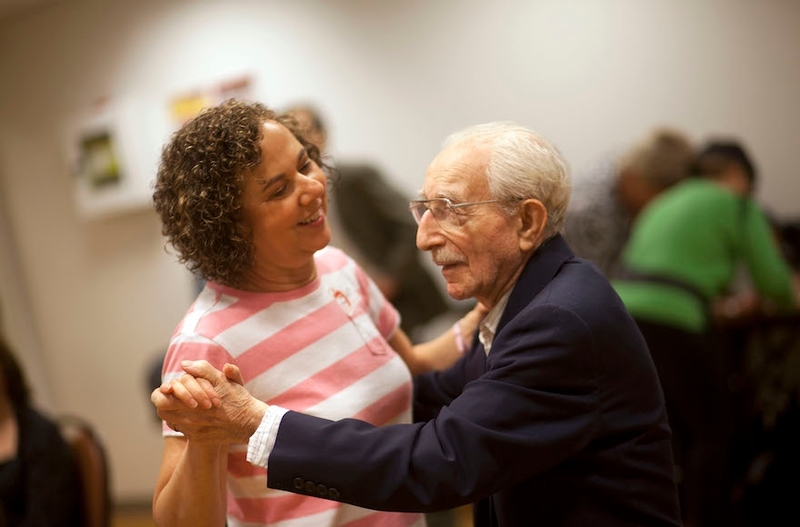 Besides Holocaust survivors, PCTI techniques can help other aging traumatized peoples such as veterans, refugees and victims of abuse. Though we celebrate the center’s tremendous impact over its first two years, we dare not rest. As co-chairs, we are deeply aware that for every survivor we help, there are dozens more who need these services. Of the 100,000 to 130,000 survivors in the U.S., many are in their upper 80s or older and one in four lives in poverty. As a group, survivors are at a significantly higher risk for depression, social isolation, declining health and the negative outcomes associated with institutionalization where unfamiliar showers, uniforms, accents and regimented schedules can trigger traumatic experiences. The center’s proven effectiveness in helping survivors is why Congress recently approved funding for a third round of grants guaranteed to keep this work going for another two years — but it isn’t enough. And thrilled as we are that federations have successfully met the preliminary $45 million fundraising goal, it must only be the beginning. Holocaust survivors in poverty need food, medical help, dental care, hearing aids and housing assistance, none of which the federal grant is authorized to provide. And as survivors grow older, their needs grow greater with each passing day. As Jews, we are charged with respecting the elderly and caring for the most vulnerable. Especially with Holocaust survivors, who have known unfathomable cruelty, it’s on us to let them know they will never be forgotten or abandoned. Each of us has something to contribute. Contact your local Jewish family services or nursing home for volunteer opportunities to work with Holocaust survivors. We know that for many survivors, nothing makes their day like a visit or a phone call from a friend. Contact your local federation or family service agency to learn about your community’s Holocaust survivor fund, or consider donating to the Center for Advancing Holocaust Survivor Care. The center is currently accepting applications from local service providers. These heroes deserve to live with dignity. It’s up to us to act quickly. ADVERTISEMENT: The transgender abba. The first female Hasidic judge. The Argentine-Brazilian-Israeli Jew living in Brooklyn. Help us tell these stories in our new series Chosen. We need your vote to make it happen. Vote today!